Your Local Moriches Power Washing Professional. Brower and Sons Long Island’s exterior pressure washing company is available for all your residential and business exterior cleaning service needs We clean any and all exterior surface's. We provide homeowners and business owners a cost effective alternative for their property maintenance needs while utilizing methods that protect our natural environment. Your decision to choose Brower and sons for your residential or commercial property cleaning services is a smart one, we are a local Long Island family owned business with many years of experience in our chosen profession, and this knowledge and experience gives us the opportunity to serve your cleaning needs to your satisfaction. The Benefits of Pressure Washing and your Moriches home. Increases Home Value: Pressure washing is the most affordable way to increase your home’s value. The National Association of Realtors wrote that "a pressure washed home can add $10,000-$15,000 to the price at sale". Protects Your Family: Your home may possess many different contaminants from dirt, mold, mildew and algae – some of which can be harmful to you and your family. Pressure washing your home, driveway, walkways, porch and patio can help prevent these harmful bacteria from growing. Enhances Curb Appeal: Curb appeal is very important if you are selling your home. Power washing your house can remove stains from mold, mildew and that can dramatically improve your homes looks to a prospective buyer. 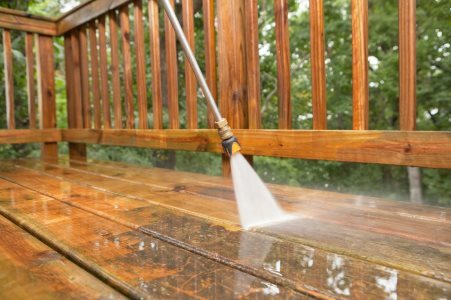 Preventative Maintenance: Preventative projects including power washing, deck cleaning and staining etc. address problems before they become a much larger issue. These preventative measures help homeowners avoid costly projects down the road. For MONEY SAVING coupons for our Moriches power washing, gutter cleaning, chimney cleaning, window washing and repairs click below. If you have any question about your pressure washing, gutter cleaning and exterior cleaning work, call us for friendly advice and free estimates.